Obviously, we are talking about the low light parties, all this tricks would give you very little if the sun is shining through the windows. 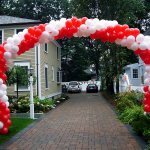 Obviously, you can put some light on the balloon decoration, the decoration will get a lot of attention. Sometimes it is a slogan instead of a name, just like on the picture below. 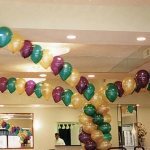 The rest of the party decorations is not birthday specific, so it can be done with the same considerations. What makes a birthday party Birthday Party? Well, a few things. Music, festive food, birthday cake, but more than anything else - decorations. 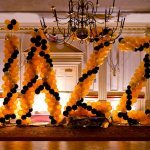 Balloon decorations, flowers, lighting, special effects - that is what makes just a party - Birthday Party.